Head of Coaching and Rugby, Tony Smith recently announced a contract extension which keeps him at the Warrington Wolves’ until November 2015. Following on from this Cortech Developments are delighted to reaffirm their belief in Tony and the club by committing to a three year sponsorship extension covering the duration of Tony’s contract. Tony Smith, Warrington Wolves Head of Coaching commented “Sponsorship is an important link between the club and local and national businesses. 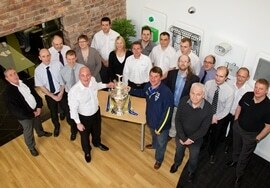 Warrington Wolves and Cortech, while operating in completely different fields, share the same common business values and appetite for development and growth. The Club and I are delighted that the team at Cortech have extended our partnership for a further three years and we look forward to strengthening the existing association between the two Organisations”. Under the leadership of Tony Smith the Warrington Wolves have become a major force in rugby league. In the past four years alone the club has enjoyed success with three Challenge Cup titles, a League Leaders Shield and a Grand Final appearance. Mark Thomas, Director of Cortech, added, “This year we are celebrating our 21st Birthday in business. In these times of austerity and cutbacks we have been able to demonstrate there are unlimited opportunities for organisations that differentiate by innovation and quality. Our customers want to be associated with leading technology solutions providers …and similarly our sponsorship of Tony Smith & Warrington Wolves reflects on our brand and our commitment to be associated with leaders on the field’.